The Blue & Blacks progressed to the semi final of the WRU National Cup, beating Bedwas 43-12 in the Quarter Final. Early pressure from Cardiff earned them a penalty in the 3rd minute. Gareth Thompson successfully converted the penalty to give Cardiff the lead. Three minutes later Ben Thomas made a clean break to set up Morgan Allen for the first try of the game. The conversion by Gareth Thompson was successful and gave Cardiff a 10 point lead. More great play by the backs led to a Joe Gatt break and offload for Will Rees-Hole to score Cardiff’s second try of the game. Another successful conversion from Gareth Thompson and Cardiff were 17 points up after 14 minutes. A 10 minute period of strong defending prevented Bedwas from crossing the line and was eventually ended when Joe Gatt was taken out in the air, earning Cardiff a penalty in their own 22. The resulting lineout from the penalty was claimed by Cardiff to setup a driving maul. A well timed run and offload from the maul saw Joe Gatt score under the posts. Gareth Thompson added the extra points to make it 24-0 before half time. Bedwas had the final attack of the half after a sloppy Cardiff scrum saw the ball pop out the back and into the path of the Bedwas scrum half. A kick and chase followed that bounced dead just before the Bedwas players could get to it. If the first half was all about the backs; the second half was all about the forwards for Cardiff. Cardiff conceded a few penalties early on that led to a Bedwas line out and driving maul inside the Cardiff 22. That maul was collapsed by Cardiff and Bedwas took a quick tap from the penalty to cross for their first try of the game. Cardiff responded immediately with a driving maul of their own, after the restart, and Joey Tomlinson grounded the ball for Cardiff’s 4th try. Gareth Thompson kept up his 100% goal kicking to make it 31-5. 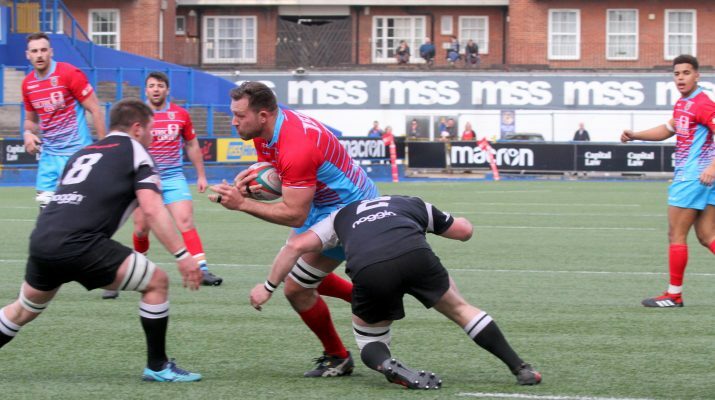 Bedwas were not prepared to give up and scored their second try after claiming the restart. The conversion was successful and brought the score up to 31-12. After the excitement of the first 10 minutes, the second 10 minutes were filled with solid play from both sides that cancelled each other out. On the 60th minute, Cardiff earned a penalty and kicked to the corner. The driving maul that resulted from the lineout saw Ian Jenkins cross the line for his first of the game. The conversion was missed by Gareth Thompson. 5 minutes later and Cardiff had another driving maul and another try for Ian Jenkins. This time the conversion was successfully kicked by Steffan Jones bringing the score up to 43-12. Ian Jenkins was yellow carded a couple of minutes later for a late tackle. Some strong defending by both teams prevented any further points being scored. Cardiff Progress to the National Cup Semi-Final and would like to wish Bedwas as the best for their remaining fixtures in the league.